Towering atop a host of Indian delicacies is this classic Indian dessert, Carrot Halwa, also known as Gajar halwa. The crux however lies in the crunch. Carrot when chewed behaves like a brush cleaning our teeth and mouth, piercing through that plaque to scrape it off, triggering saliva, a clear liquid and a vital contributor to a healthy body…. Can we afford to stay off from this delicious veggie that is low in salt and calorie, high in fibre, a natural body cleanser, age retarder, blood sugar regulator and much more? Wash carrots (select sweet and juicy ones) thoroughly in water. Drain out the water. Peel the skin and grate the carrots. Soak saffron threads in a tbsp. of milk in a small bowl. Keep it aside. Crush cardamom seeds just enough to release their flavour. In a heavy bottom pan, melt ghee. Fry cashewnuts till golden brown, also fry raisins. Remove them from the pan and keep aside. In to the same pan, put grated carrot and sauté for few minutes stirring constantly over gentle flame. Now add milk and let it boil on medium flame. When it begins to boil, reduce the flame, let it simmer, but keep stirring and scraping the sides. If not, milk can scorch. Also make sure the spatula is dug deep down to the bottom of the pan while stirring. Add the soaked saffron threads. Continue simmering till the quantity reduces to a third. At this stage, the milk should nearly be not seen and the mixture should look thicker. To this mixture, add sugar. The mixture becomes watery again. Keep stirring at intervals till the sugar is completely dissolved and the dish starts thickening once again and changes colour to deep red. Switch off the flame. Add cardamom powder, fried cashews and raisins. Serve it hot, warm, cold or at room temperature. 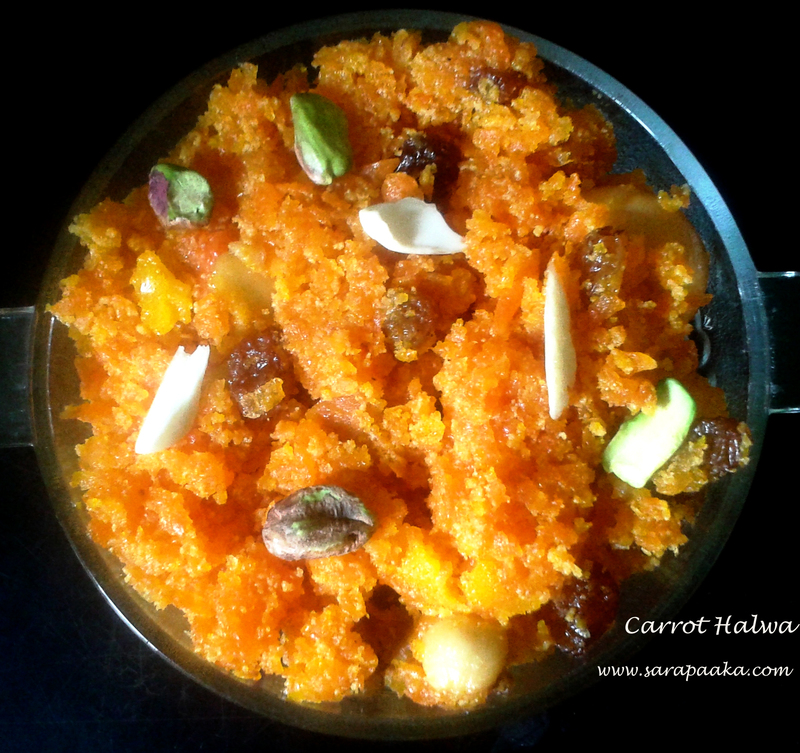 A blob of hot carrot halwa over a scoop of vanilla ice cream makes for a great hot n cold combo dessert! Unsalted Pistachio nuts, blanched almonds can be used for garnishing. Regular milk, sugar and ghee can be replaced by Almond milk, date paste and cashew butter respectively. Adding sugar early i.e., along with milk prevents halwa from gaining a soft texture. Khoya or mawa lends a soft, creamy texture to the halwa. Either sweetened or unsweetened variety can be used, but quantity of sugar has to be adjusted accordingly. Khoya has to be added and allowed to mix and melt before adding sugar. Condensed milk makes for a richer, creamier, sweeter halwa. Again it calls for adjustment of sugar quantity. Cook carrot in pressure cooker. Use condensed milk instead of skimmed milk and sugar. 1 medium size carrot when shredded measures ½ cup. Vegetables, when shredded, look like long strips (long and thin similar to noodles) whereas, when grated, the result is very tiny pieces to the point of being powdery. Time taken for cooking is longer when shredded as compared to gratings. Shredded vegetables look smoother and uniformly textured whereas gratings appear uneven.